If Duke SERMONETA  expected to butcher Buffalo Bill to make a Roman holiday he was disappointed. 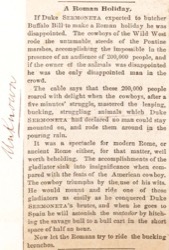 The cowboys of the Wild West rode the untamable steeds of the Pontine marshes, accomplishing the impossible in the presence of an audience of 200,000 people, and if the owner of the animals was disappointed he was the only disappointed man in the crowd. 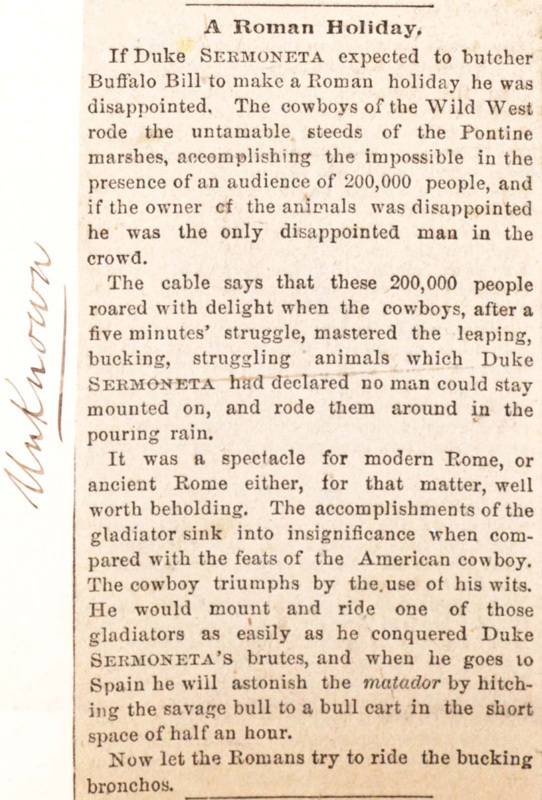 The cable says that these 200,000 people roared with delight when the cowboys, after a five minutes' struggle, mastered the leaping, bucking, struggling animals which Duke SERMONETA had declared no man could stay mounted on, and rode them around in the pouring rain. It was a spectacle for modern Rome, or ancient Rome either, for that matter, well worth beholding. The accomplishments of the gladiator sink into insignificance when compared with the feats of the American cowboy. The cowboy triumphs by the use of his wits. He would mount and ride one of those gladiators as easily as he conquered Duke SERMONETA'S brutes, and when he goes to Spain he will astonish the matador by hitching the savage bull to a bull cart in the short space of half an hour. Now let the Romans try to ride the bucking bronchos.